Prague | and sure stars shining . . . Many people consider this church to the most beautiful Baroque-style church in Prague. It is truly magnificent. This entry was posted in Travel 2015 and tagged Prague, St. Nicholas Mala Strana on July 20, 2015 by Jeffrey Carter. I made it to Strahov Monastery this trip! Birthday selfie at the monastery. The Religious Library and the Philosophical Library are stunning beyond belief. 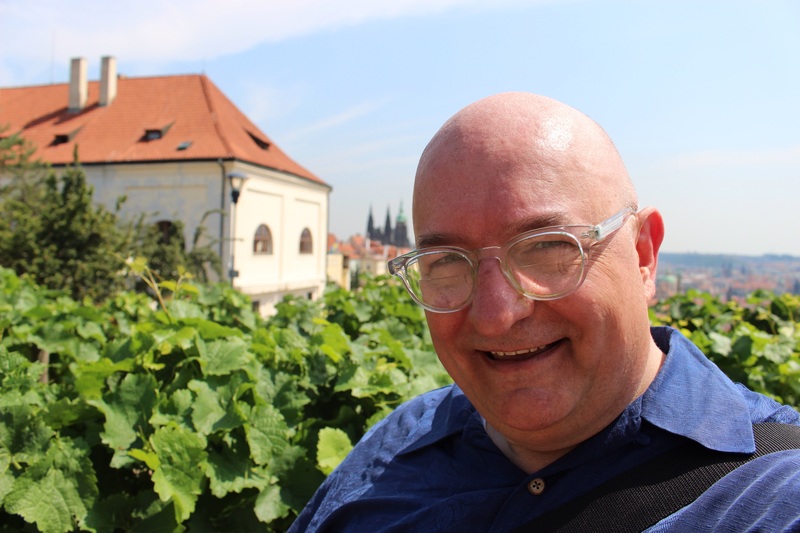 This entry was posted in Travel 2015 and tagged Prague, Strahov Monastery on July 19, 2015 by Jeffrey Carter. Friday was our last day in Prague. And Friday was my 54th birthday. K has been a wonderful travel partner this trip, but I know his limits. He doesn’t do many churches, and I do. So I set out on my own agenda today to walk into any church I could find, and to see some Beethoven and Mozart manuscripts in a palace at Prague Castle. I ate pizza and drank local beer at lunch in a beer hall associated with the monastery. And by 2.30 p.m. I was beat (in the heat) and came back to the flat to nap for a while. Isn’t happening a god-given right on ones birthday? Now, at 5.45 p.m., I am about to depart for dinner, some shopping, perhaps a Mozart opera, or perhaps a long massage. Stay tuned. 10.45 p.m. now. I am in for the evening, and needing to pack, which is a problem since I have a load of laundry in the dryer, having decided that I do not wish to travel home with too much laundry facing me . . . .
K and I took one last walk across the Charles Bridge this evening, and then braved the summer holiday mobs in the narrow streets of Old Town. We found the crystal shop recommended by our private guide (Petr), and I purchased some Bohemian crystal to bring home. We found our way somehow to the Estates Theatre, where I found this evening’s performance of Don Giovanni was sold out. Alas for that. Dinner at Cafe Cafe was yum-some, as was the dessert of a local cream tart kind of thing. I took the subway back to the flat, and then spent two hours under the delightful ministrations of a Thai masseur in a traditional Thai massage — all pressure and stretching. And I feel so relaxed right now. From now on, I spend every birthday in Prague, and see churches and monasteries, and get a massage, and buy crystal. This is now my life. The taxi arrives to transport us to the airport early, so I shall post one photo, and then deal with the rest in transit on Saturday. This entry was posted in Travel 2015 and tagged churches, monasteries, Mozart, Prague on July 18, 2015 by Jeffrey Carter. I was out of the flat quite early on Thursday so that I could catch the sun breaking through the overcast, and snap some shots of the Charles Bridge before the tourist throngs descend. Why does the stag have a cross? Detail of one of the statue’s bases. The cathedral tower from the Charles Bridge. The green building is ours. One of my bedroom windows (3rd floor, north end) is open to the morning air. 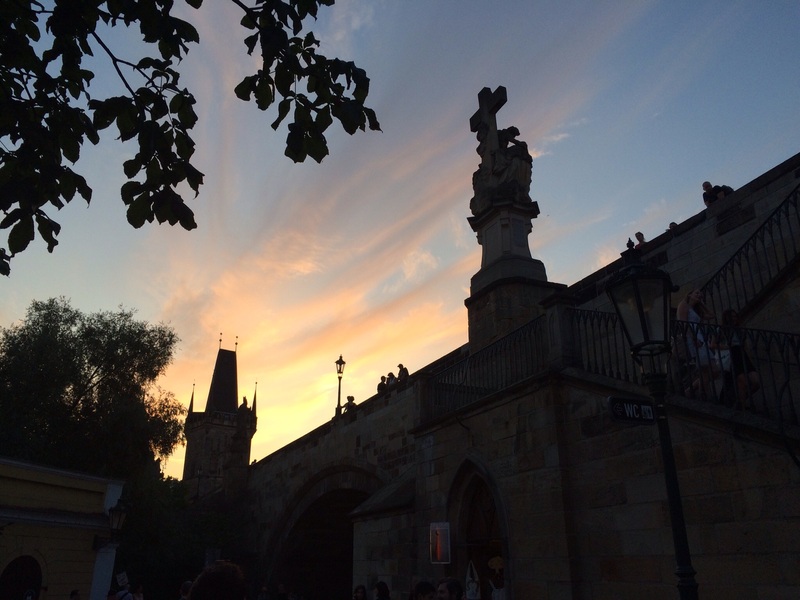 This entry was posted in Travel 2015 and tagged Charles Bridge, John Nepomuk, Prague on July 17, 2015 by Jeffrey Carter. Wednesday was a very full day, or so it seems as I write on Wednesday evening around 10 p.m. and feel just absolutely drained. I started the day with waffles and some Czech honey I purchased at the store, plus a big bowl of strawberries. And coffee. Petr, our local guide, met me just before 9. K wasn’t feeling well, so it was just me on the morning tour of the Jewish Quarter, the #1 local site. I had an hour-long tour of this area eight years ago, but this mornign, with a private guide who is terrifically versed in local history, the tour induced tears and sorrow and anger at the monstrous, horrific way we have treated our Jewish brothers and sisters. Lunch at a courtyard cafe (potato soup, a ham toastie, water for about $5) led to a nap. K and I had booked a Czech beer tasting tour, so we set out for that, but stopped first at the Old Town Square. The beer tasting itself included seven different Czech concoctions, with history and brewmaster tips mixed in amongst the sips. We had a good time in a small group that included four US citizens and two Aussies from Melbourne. I ventured down the street for one more beer at the Lokal, a place that deals in delivered-that-morning, unpasteurized, unfiltered fresh beer. The taste was incredible . . . truly beyond anything I can describe. And then a walk, a subway ride, a tram ride, a trip to the grocery store, and home, but just briefly. Kampa Island is literally just around the corner from our flat. (The island is a man-made creation; my bedroom window looks over the canal that is the western boundary of the island.) This week, in honor of Bastille Day, the island is hosting a French food and wine festival. So I partook. Joyfully. The festival atmosphere is powerful and friendly. A collage from Terezin, at one of the Jewish museums. At the French street fair. Look for the bubbles she is blowing. This entry was posted in Travel 2015 and tagged Prague on July 16, 2015 by Jeffrey Carter. 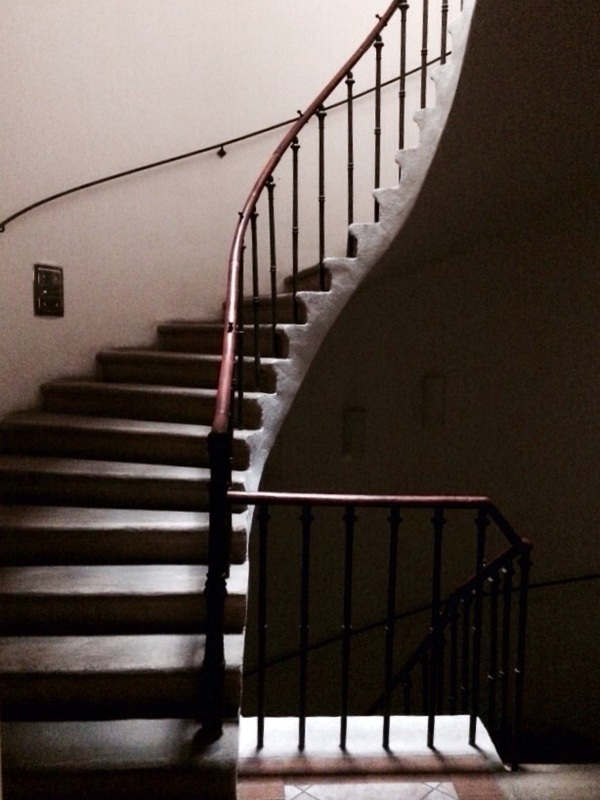 The stairway to our apartment. We are in an OLD building in the Mala Strana. Our first full day in Prague started in an unusual way. K is usually the latter one up, so I tiptoe around and try to not to disturb him. Our rooms have been side-by-side this trip, but the common area of kitchen and living room (and here a separate dining room) are all nearby. I awoke at about 5.30 a.m. this morning to the most delightful text from my dear student Jacob Scott. Since sleep hit me at 9.30 the night before, I just went on to bed, and thus was wide awake at daylight today. So I got up and nearly immediately parked myself on a chair in the living room and looked at email. (Good news was waiting from the National Association of Schools of Music!) And then I hear K padding down the hallway; he was wide awake too. We’ve had a bit of rain today — morning and evening only. Meals included eggs, bread and butter, salted meats, and yogurt here at the apartment; traditional Czech cooking at the Lokal, a nearby corner restaurant, at lunch; and pizza for dinner. We’ve made two stops today at the nearby market too. The feature of today was the guided tour of the Castle District, and I posted that blog a few hours ago. We spent some time with Petr after that, asking a lot of questions about local life and where to find things. (He’d been very helpful with history and culture in our morning together.) After lunch, we set out by tram to go to a more residential part of Prague, where we stumbled around for a while. Then we went to Wenceslas Square, the ceremonial hart of Prague. A casino called our name, and while K busted, I came out about 50% ahead of where I went in. Blackjack was good to me today. Subway and a walk back to the apartment led to naps. With the rain, I think we are in for the evening at 8 p.m. In previous trips I’d have been hankering for something to do every night, but these apartments feel so much like home, and the walking on cobblestones is so tiring (I’m conscious of being very careful) that I’m happy simply to stay in once dinner is over! Tomorrow = the Jewish Quarter and Prague Old Town, plus a Czech beer tasting tour later in the day! On the building across the street. Segways are everywhere. A nuisance. At least this kid on our street had a helmet on. The river,and the Charles Bridge, from the south. An albino peacock up a tree in the Senate Garden. This entry was posted in Travel 2015 and tagged Prague, Prague Castle on July 15, 2015 by Jeffrey Carter. Train carriage corridor in our first-class cabin. German police at the border crossing. Elbe River in the Czech Republic. We arrived in Prague around 3.30 p.m. today, and arrived at the apartment just after 4 p.m. The apartment? This place has nearly as much floor space as I do in Saint Louis! We have a large living room with two overstuffed sofas, a full dining room and kitchen, 1.5 baths, washer/dryer, and two large bedrooms with queen-sized beds and all sorts of extra room. My bedroom windows look out on the Charles Bridge (only one of the oldest in-use bridges in the world at 750+ years). And the living room has views of the Prague Castle. Dinner tonight was a lovely Czech goulash at the nearby Tre Stoleti. We took a short walk before dinner, but we are both dead tired today. I suppose that’s what two days of bike riding will do…. The train journey today was totally uneventful, although the trip along the Elbe River east of Dresden and into the Czech Republic was one of the most beautiful journeys I have ever taken! On the Charles Bridge in Prague. Lunch on the train = paprika chicken. The view from my room in Prague. This entry was posted in Food, Travel 2015 and tagged Elbe River, goulash, Prague, sunflowers on July 14, 2015 by Jeffrey Carter.